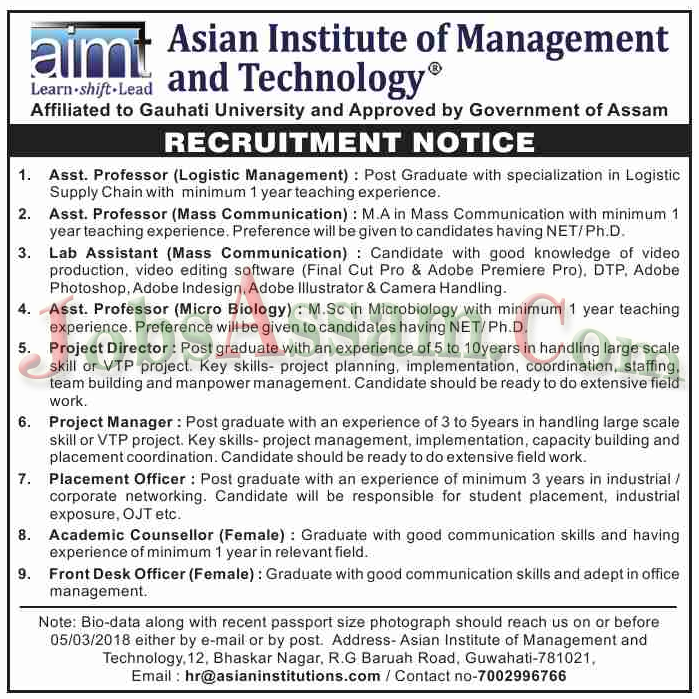 Asian Institute of Management and Technology, Affiliated to Gauhati University and Approved by Government of Assam Recruitment. 1. Asst. Professor (Logistic Management): Post Graduate with specialization in Logistic Supply Chain with minimum 1 year teaching experience. 2. Asst. Professor (Mass Communication): MA in Mass Communication with minimum 1 year teaching experience. Preference will beg,en to candidates having NET/PAD. 3. Lab Assistant (Mass Communication): Candidate with good knowledge of video production, video editing software (Final Cut Pro 8 Adobe Premiere Pro). DTP. Adobe Photoshop, Adobe indesign, Adobe Illustrators Camera Handling. 5. Project Director: Post graduate with an experience of 5 to 10 years in handling large scale skill or VTP project. Any skills- project planning, implementation, coordination, staffing, team building and manpower management. Candidate should be ready to do extensive field work. 6. Project Manager: Post graduate with an experience of 3 to 5 years in handling large scale skill or VTP project. Key skills- project management, Implementation, capacity building and placement coordination. Candidate should he ready to do extensive field work. 7. Placement Officer: Past graduate with an experience of minimum 3 years In industrial r corporate networking. Candidate will be responsible for student placement, Industrial exposure, OJT etc. 8. Academic Counsellor (Female): Graduate with good communication skills and having experience of minimum 1 year in relevant field. 9. Front Desk Officer (Female): Graduate with good communication skills end adept in Office management. How to Apply: Bio-data along with recent passport size photograph should reach to the address below on or before 05.03.2018 either by e-mall or by post.